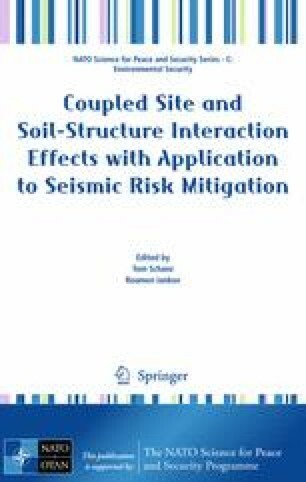 The present work aims to examine how and to what extent potential soil nonlinear-ity may affect: (a) the dynamic distress of a rigid fixed-base retaining wall and (b) the seismic response of the retained soil layer. For this purpose, a parametric study is conducted which is based on 2-D dynamic finite element analyses. Soil nonlinearity is realistically taken into account via the commonly used equivalent-linear procedure. In order to examine more thoroughly the influence of material nonlinearity, the developed numerical model is studied under idealized seismic excitations and several intensity levels of the imposed ground acceleration. The results justify the perception that the nonlinear soil behavior has a considerable impact on the dynamic earth pressures developed on the wall and the amplification of the acceleration developed on the backfill as well.